The Maley Center, home of Community Programs and administrative offices, on Bragaw. Student artwork is on display in the lobby and throughout the building bringing inspiration and colorful cheer. 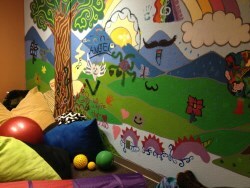 Student-designed art wall in the sensory room, a therapeutic space for activity therapy. The Jesse Lee campus, home of our boy's residential program, offers a peaceful, therapeutic setting. Residential facilities provide 24-hour care and guidance between youth and staff. Students often have private bedrooms, although in some situations may have a roommate.